So here we go...we very carefully selected our outfits for this trip because my SIL has her own Etsy store and many of these ladies handmake beautiful items. 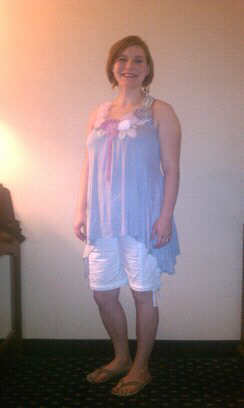 My top came from Charming Charlie, and my shorts came from Steinmart. My earrings are also from Charming Charlie and they are my favorite. I don't like jewelry very much do they have to be something special for me to bother with, let alone LOVE! My SIL is in an Elle top that came from Kohl's. Her jeans came from a store called Maurices in Waco. Side note: I adore Maurices. They have some super cute stuff in a wide range of sizes and have some great deals on their sale items. She is wearing adorable Merona sandals from Target - a bit jealous about those. Jenni has her own Etsy store - Ragamuffin Beauties - and the earrings she is wearing are PeachMum, debuting in her shop immediately following the Creative Estates conference. It has a special place in both of our hearts, but I'll share some more of that later.